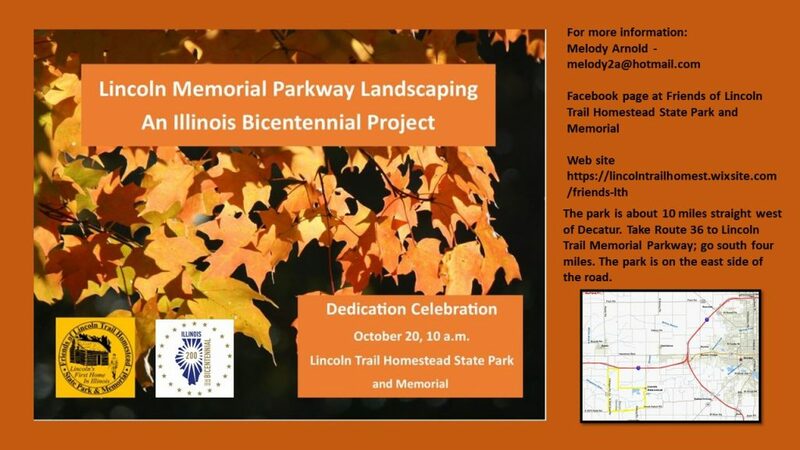 On behalf of the Friends of Lincoln Trail Homestead State Park and Memorial, we request the honor of your presence at the Dedication Celebration of the Lincoln Memorial Parkway Landscaping Project. You have followed The Friends of Lincoln Trail Homestead State Park, a committee of the Macon County Community Environmental Council, since it was formed to bring this site up to the standards of other Lincoln sites in Illinois, making it a desired Lincoln destination in Macon County. We greatly appreciate your continuing support in helping us accomplish our goals. We would appreciate the opportunity to show you more about this exciting project and the park, as it is an important historical place, honoring Abraham Lincoln’s first home in Illinois and the beginning of his road to the White House. The event will be, October 20, 2018 at 10:00 A.M., beginning at the Memorial with a brief flag ceremony conducted by the Macon County Honor Guard and Harristown Boy Scouts with music provided by the Sangamon Valley High School Band. The dedication will then proceed to the Railsplitter Pavilion where the retired Honorable Judge Spears, from the Abraham Lincoln Association, will give a short speech and dignitaries as well as a special guest will speak a few words. Refreshments will be provided. In 1939, after the establishment of Lincoln Trail Homestead State Park, Macon County acquired 80.61 acres to create a right-of-way 200′ wide running north and south as scenic highway, named the Lincoln Memorial Parkway to access the new State Park. At present there are a few trees, but mostly scrubby species and turf. The goal of this project was to provide an attractive parkway leading to the Lincoln Trail Homestead State Park with grouped plantings of native tree species every half mile. The Macon County Highway Department has agreed to do the planting of the 75 trees selected. Funds were raised to purchase the trees using the promotion: “In 1830 Abraham Lincoln split rails for the family’s first home in Illinois; $18.30 will sponsor a tree for the Lincoln Memorial Parkway.” Sponsors responded enthusiastically and proceeds not only covered the cost of the trees, but also delivery and watering. The trees will arrive October 15th, and thanks not only to the Macon County Highway Department and Bruce Bird, but also to the 16 volunteers who have agreed to assist by locating the trees to designated areas, flagging, placing tree guards and doing the initial watering, the trees will grow for the enjoyment for all entering this significant historical site. We greatly appreciate your consideration of this request and look forward to seeing you at the Dedication.